Looking for antique Georgian jewelry? Adin has some of the most exquisite brooches, engagement rings and other fine jewelry. The Georgian period spans more or less the reign of the four successive English kings George I, George II, George III and George IV between 1714 and 1830. Georgian jewelry is rather rare as when time passed most was worn out, melted or taken apart and re-used for more modern designs. Materials like gold, silver and diamonds were very scarce and expensive and little consideration for fine craftmanship was taken with the "old stuff" when the owners wanted to wear their gold and diamonds according to the latest fashion in jewelry. Most Georgian Jewellery available is from the later dates characterized by highly dimensional repousse. Floral and scroll motifs are typical of the period and the most common stones used are garnets, precious topaz, coral and early faceted diamonds set in silver. During most of the 18th century, diamonds were set in closed silver-settings, a technique used because jewelers of that time believed that only a silver mounting could render the true beauty of a precious stone. They were also aware of the fact that silver jewelry often left black stains on clothing or skin, so they resolved the matter by coating the backs of the jewels in gold. Georgiab jewelry was custom designed to suit the diamonds that were available. Stones were never specially cut for the pieces. The most common cuts used in antique Georgian jewelry designs were rose-cuts and table-cuts. 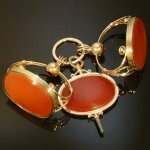 Have a look in our catalogue and find some antique Georgian (engagement) rings or brooches.